Once you’ve dipped your toes in the sea of diamond knowledge, there’s no turning back to simply trusting what the jeweler says! More and more tools will be known to you. Although their names are unfamiliar to the mainstream, they’re very handy and can truly help you in choosing the right diamond. The reality is, to the untrained eye, it’s challenging to tell a well-cut diamond from a poor cut. And given the outstanding lighting a brick and mortar store flashes its customers with, it’s not hard to notice why a diamond can suddenly turn dull upon exiting the store. Adding Idealscope-reading in your skill set will help you critically choose or filter diamonds based on their visual performance, and in turn, end up with a super excellent gem! Now, this post is all about the Idealscope, but not just how to use it, but how to find the best diamond with it as well. If you want to start out examining the light performance of a diamond, there’s no better place to start out than with an Idealscope image. It can tell you a lot about where the light is leaking and how much light a diamond will actually reflect back to you. And as we know, only a diamond a lot of the latter will be the one full of brilliance, fire, and scintillation. You should always demand an Idealscope image before buying a diamond – whether you are buying in a brick-and-mortar store or online. Some jewelry stores have Idealscopes, but many don’t. The same applies to online diamond vendors. Most of them are only dropshipping their diamonds and thus are not able to offer you such images. 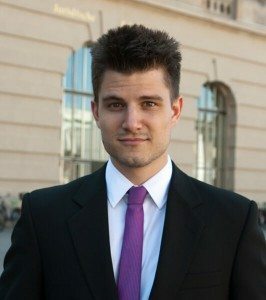 James Allen, Whiteflash, and Brian Gavin are one of the good ones that show Idealscope images before buying a diamond. Basically, there are only three colors you need to pay attention to. The red color signifies areas of light reflection which are highly desirable. You want your diamond to reflect a lot of light! The dark color symbolizes the symmetrical and distinct dark contrasts in a diamond. You also want to have your diamond to have these contrasts because they will make your rock appear brighter. That sounds counter-intuitive but see it as a chess board. It only has half the light return of a completely white board, but when you move it, it will appear livelier than the white one. This is due to the scintillation effect caused by contrast. For this very reason, dark contrasts in diamond are always welcome. The strongest ones are provided in hearts and arrows diamonds which offer a strong opposing pattern. The light red color in an Idealscope image symbolizes areas where the diamond is reflecting back less light. 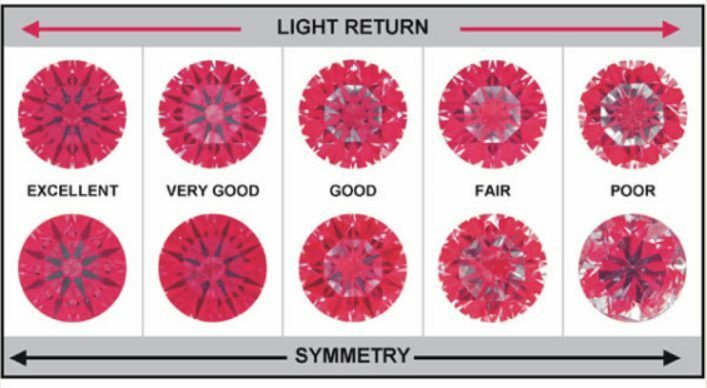 Every diamond has some areas of lighter red although, in super ideal cut diamonds, even these light red areas are harder to make out. So, the less you find it in an Idealscope image, the better the diamond’s overall light performance will be! Now, the white color symbolizes areas of light leakage. It is clear that you want to avoid diamonds with this kind of leak. They occur due to bad proportions which means that certain angles within the diamond are outside the perfect diamond proportions. But actually, it does not matter so much whether you understand why a diamond leaks light. The most important thing you need to know is that it does leak light. And Idealscope images can help you a lot with that! 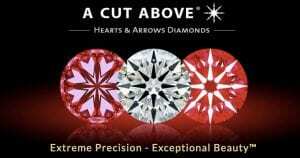 The diamond on the left is taken from Whiteflash’s A CUT ABOVE signature line – one of the worlds #1 cuts. The diamond on the right is from the Premium Select signature line. I think that there’s no need to encircle the areas of white light in the right diamond. 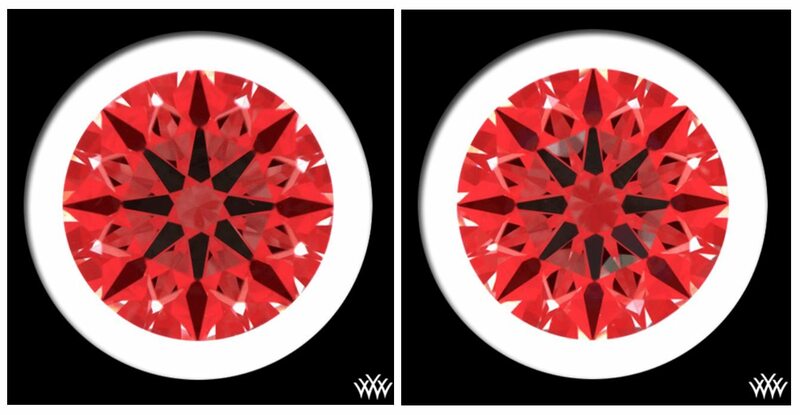 It’s pretty obvious that compared to the left one, the right diamond leaks more light. Entertained yet? This one is an extremely tough call to make! And indeed, if it wasn't for one little extra feature that I wanted to show you in this example, I think I would have a difficult time choosing the best diamond, too! Now, in all three diamonds, we cannot make out any white spots that would indicate light leakage. But we can see areas of lighter red relative to the darker red. So, let’s only pay attention to the lighter ones. 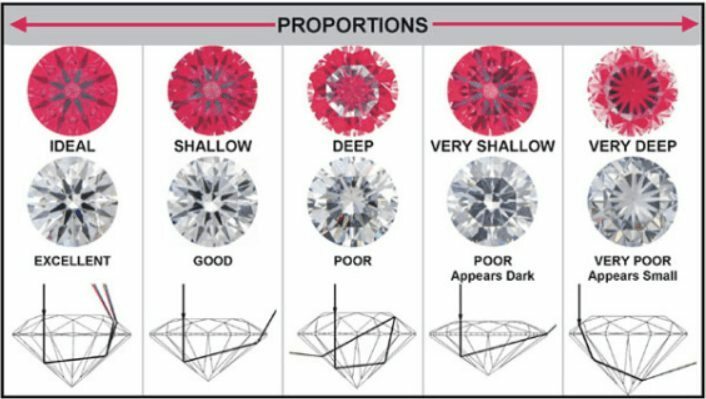 Which diamond has the most? Correct! It’s the right diamond. Look closely at the black color. In the diamond on the left, the contrasting color solely comes from the arrows in the diamond. As I have told you, contrast is good, but if you can have an area of light return instead, it is even better! This is due to the fact that you already have a nice contrast in the arrows anyway. 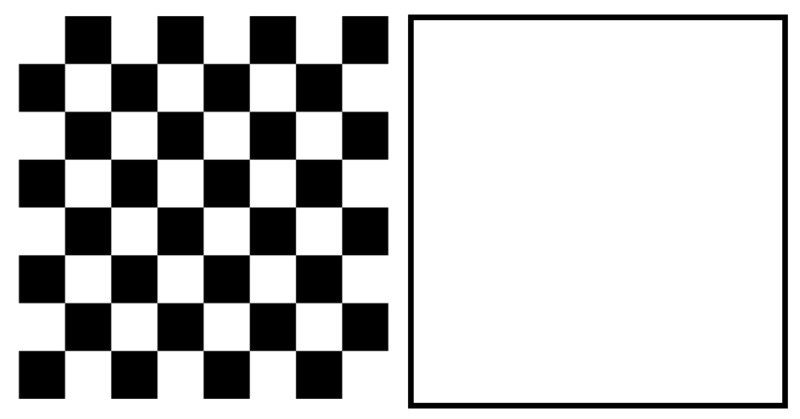 The diamond on the right, however, also displays minute areas of contrast apart from the arrows pattern. I have circled these areas in blue. This is very common, and you have nothing to worry about! Although the contrasting pattern that didn’t come from the arrows isn't symmetrical. You can clearly see it just looking at the blue circles. They are spread unevenly. In a case like this, the brightness effect through the contrast will be diminished, and it is wiser to go for more areas of light return. Please note that these are tiny differences that you would most likely not notice with your naked eye. Furthermore, the dark areas that I encircled can have a positive impact if they are evenly distributed. Still, if you are here to make the best choice, this is what you have to do. The funny thing is that the diamond on the left is from the Expert Selection and not from Whiteflash’s A CUT ABOVE signature line. So, the diamond on the left didn’t make it into the A CUT ABOVE signature line because it doesn’t possess the best polish grade. In reality, though, you will most likely never see a difference between the best and second best. You can read more about that in my post about diamond polish. I know that such Idealscope analyses can be quite tricky sometimes! Should you have any questions, feel free to leave a comment or drop me a mail!